Facebook is reportedly looking to overshadow the recent success of photo-sharing iPhone apps such as Instagram and Color with its own photo-oriented app. TechCrunch says it has received a load of images and documents relating to Facebook's plans to launch a standalone app, which will tap into the 6 billion photo uploads the social network receives every month. The Facebook photos app project, which is meant to be secret, appears to be a combination between three popular apps in the App Store: Path, which lets you share photos and short videos with up to 50 people; Instagram, which is a social photo sharing app (with photo filters and effects included); and Color, which pools photos from people around you, based on your GPS coordinates. It's unknown how the app will work, though TechCrunch's MG Siegler describes the iPhone app as "amazing" and "awesome." You can see the alleged screenshot of the app's main interface on the left. The screenshot shows a series a photo tiles displayed chronologically underneath each other on the display. One is a photo album, while the other two appear to be tagged photos. There's also a camera button and what appears to be a photo notifications icon on the bottom right, and a menu item bottom left. This interface is more photo-centric than Facebook's current photos interface in the official iPhone app, which only displays small thumbnails and album information at a glance. 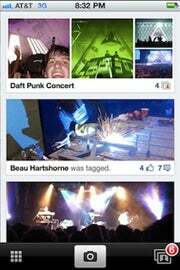 Overall, the presumed secret Facebook photo app is said to be a stand-alone app, which could carry the name of Hovertown or WithPeople. Another possibility would be that this interface will be integrated into the current official Facebook app, replacing the old Photos menu, and the functionality could be integrated into the main site as well. So far, Facebook says it has around 100 million users using its official mobile apps to update their status, so improved functionality for photos could indeed deter many users from other social photo sharing apps. However, if the initial indications are accurate, Facebook's app does not have any editing features available like Instagram, or location-based pooling, as with Color, so it wouldn't pose a big threat to Instagram, Color or Path -- yet.